Far too many dogs put the “d” in dig. Understanding this canine motivation is the first step in protecting your prized roses, your herb garden and your lawn. Here is the prime reason why behind this gotta-dig mentality: Thousands of years ago, dogs in the wild did not know where their next meal would come from, so after a kill, they would bury any uneaten food to hide it from scavengers. They returned to this “canine pantry” when they were hungry again. The dirt also helped to keep their food fresher longer by protecting it from sunlight. Your 21st Century canine is just following that ancestral urge – doesn’t matter that you feed your dog every day. It’s hard to take that “must stash food for a hungry day” mentality out of your dog. Another reason dogs dig is to burn off energy and relieve boredom. These are signs that your dog needs to be exercised more often – and more vigorously. Take long walks in the morning and evening and vary the routes. 1. Create a mini “doggyland” by devoting a portion of your backyard to your dog. Buy an inexpensive plastic kiddy pool, fill it with dirt and hide a few dog treats and toys for your dog to discover. Or put about one foot of water and create an instant doggy pool. Encourage your dog to bob for balls and replace the water each day to keep it fresh. 2. Treat your dog to his own made-in-the-shade spot in the backyard by taking an old picnic table, sawing the legs in half to make it lower in height. This gives your dog the option of lounging under the picnic table for shade or sitting on top for sun. 3. Stash your delicate flowers and herbs in hanging pots out of paw’s reach. Designate a small section in your backyard to grow greens like alfalfa, barley or wheatgrass if your dog likes to nibble on grass. 4. Spritz your garden with what seasoned gardeners refer to as “pepper pooch.” Mix two tablespoons of cayenne pepper and 6 drops of dishwashing soap in a gallon of water. Place this solution in a spray bottle and apply it to your plants. Schedule this spraying when your dog is not around. Wait at least 10 minutes for it to dry before you allow your dog in the backyard. 5. Fill in the holes where you dog has dug and place heavy rocks on top of these spots. 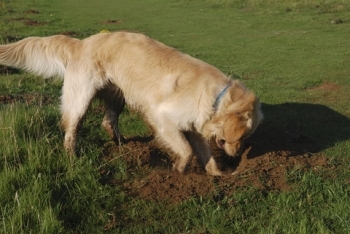 Dogs usually prefer soft dirt to carry out their excavations.